A plant requires several renovations over a period that can be difficult to manage. It requires a professional service to have an inplant office system set-up that is in accordance with the client’s needs and wants. When looking for a shipping office for sale, the focus has to be on build quality, efficiency, and overall affordability. Clients require the perfect package as this is an essential part of the enterprise and only the finest is acceptable. Let’s take a look at what makes this such a special choice for those interested in getting a proven solution. When it comes to finding a shipping office for sale, the durability of its build is a critical component that has to come under due deliberation. The best modular shipping service has to be of the highest quality and last for a long time. For an enterprise, it is a significant investment and that makes it’s durability of utmost importance both in the short and long-run. This service is able to guarantee a durable, professional solution that is designed in accordance with the client’s needs and wants. Everything is taken into consideration prior to the installation to make sure the solution is flawless. Worried about how long it will take to have the office installed and ready to go? With a business, it is essential to have everything up and running as soon as possible in order to make sure everything is functional. It can become frustrating to have the installation process take up time and space, which will lead to a loss of money in the short-run. This service has been around for a long time and has the finest professionals ready to get started on making the installation a quick and easy one. When it comes to the efficiency of one’s employees and their work environment, the office has to be of the highest quality. A lot of physical pressures are placed on such environments and it is essential to have it built right. Panel Built is always looking to go the extra mile for its clients in order to make the built offices safe and secure. All of the parts are of the finest quality and can withstand a rigorous amount of pressure and related work factors. The parts are tested repeatedly to make sure it is built right and there are no issues down the road. Looking to find a place that is quiet and away from the noises of the plant? This can be a concern for those who are looking to find a nice, safe spot inside the plant that can house all of the management work. This office will ensure the office is secure and will not have serious noise pollution from external factors that can be seen in the plant environment. 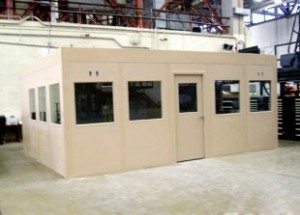 Panel Built makes sure the office is secure and will remain quiet from the inside for the staff. This is critical for those who are looking to create a proper, professional office inside to conduct business. This factor is often not given importance, but holds a lot of value for enterprises that want to have only the best. 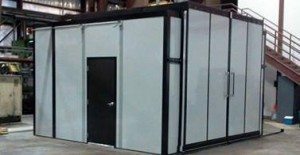 Comfort is critical when it comes to these modular offices that are being installed into the plant’s interior. When it comes to finding the best shipping office for sale, this is critical. The right option has to be comfort as in this day and age, build is not the only positive needed. The overall comfort level inside the office has to be at an optimal level to ensure the employees enjoy using the installation and all of its benefits. An enterprise has to make sure the pricing is fair and reasonable when it comes to this office. The shipping process can be completed within two days and that is essential for those who want to find a quick solution, but is it affordable? Yes, Panel Built is focused on finding a solution that is perfect financially for the client. The client deserves quality, but at an affordable price and this is what this service is dedicated on providing. The shipping office price will always be the most competitive and reasonable one on the market.